December is right around the corner, which calls for celebrations! Please save the evening of Thursday, December 6 to celebrate another year with the EERI Northern California Chapter. 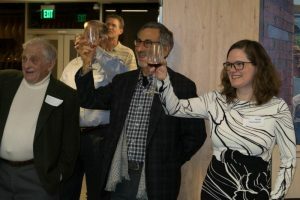 This year the party will be at Arup’s new office in downtown Oakland, which is steps from the 12th Street Bart station and has spectacular views of Oakland and the San Francisco Bay. Come mingle with friends and colleagues while enjoying delicious food and drinks! Time: 6:00 pm – whenever you get tired!